No matter what your unique style, Joy can create a dramatic and beautiful bridal hair style for your special day. Styling your hair to best showcase your beautiful features as well as compliment your dress and veil, Joy can help you feel as beautiful as ever on your wedding day. Let Joy take the pressure off of your entire bridal party! Joy and her expert team of hair stylists can create beautiful hair styles for each member of your bridal party. No matter what style you have in mind, Joy and her team can work with you to make your bridesmaids’ hair sparkle. Most brides are never 100 percent sure what type of hair style they want for their big day, but they know it when they see it! That’s why Joy always provides a trial-run styling session for her brides and bridal parties. 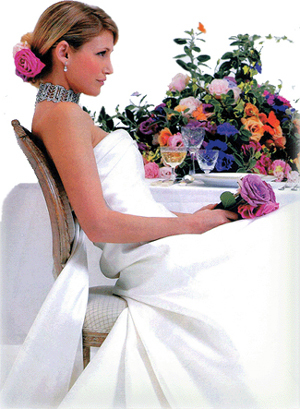 You’ll meet with Joy and enjoy a day of pampering as you bridal hair style takes shape! Your big day brings enough stress. That’s why Joy and her team make your day a bit easier by traveling to you to create your bridal party’s hair styles. No matter when or where, Joy and her team are able to easily help you and your bridal party achieve the perfect wedding hair style. If you’re thinking about adding extra pizzazz to your wedding hair style, hair extensions may be just the look you’re after. Joy and her team are hair extension experts and can create a dramatic wedding hair style for you and your bridal party using the best extension products available. A master of color and cuts, Joy can help you and your bridal party look your best on your wedding day with beautiful color and cuts. No matter if you’re looking for a simple trim or want to play with new highlights, Joy can work with you to create the perfect wedding hair style that includes the best cut and color for you and your entire bridal party. Whether you already have your veil or are looking for a more customized head piece, Joy can create a beautiful wedding hair style to complement your specific needs. Utilizing beautiful flowers, Joy can add life to your bridal hair style or create a custom veil to showcase the hair style you’ve chosen for your big day. For more information on Joy Fields bridal hair style services, contact us anytime at 760.989.3774 .